Over the past year, we have seen many times when the weight of evil seems to bear down on marginalized people in egregiously visible ways, flaunting its power and its certainty while so many stand watching, silent. We have seen the granite blocks of America’s racial legacy continue to be heaved upon a purported road to progress, in the continued refusal to name the criminalization and deaths of black men and women — Eric Garner, Marissa Alexander, Michael Brown, Tamir Rice — at the hands of police who are supposed to serve to protect them. The protests in Ferguson, Missouri, seemed to spring from nowhere as spontaneous responses gathered in the streets, making visible the life of Michael Brown that had been so senselessly taken. From those protests emerged young women and men who have protested every day at great personal cost. Confronted with the state’s refusal to seek truth, these protests have spurred declarations across the country that #BlackLivesMatter. As the streets of New York, Dallas, Berkeley, Seattle, and so many other cities fill with determined voices, perhaps we are seeing the emergence of a powerful refusal to be hidden, to be disregarded, chained, shot, and criminalized. Internationally, we have seen the Chinese government press more blatantly against the people of Hong Kong, seeking to control more strictly the pool of candidates who can be chosen in a “democratic” process. A contested relationship for decades finally poured into the streets in an “Umbrella Movement,” as China sought to limit the democratic processes, people filled the streets and endured police brutality. In the face of this resistance, the protesters blocked traffic for weeks and occupied the center of Hong Kong’s Central Government Complex. In Mexico City, thousands marched against the president’s use of government funds and improper relationship with business against the backdrop of a violent massacre of student teachers in September, all while the police remain poised more fervently against the protesters than toward the pursuit of justice for those killed. The streets filled with a desire to hold the government to account, calling for trust and action for the innocent. In all of these movements, we see the reality of a world where power seems to pave over the ground of the lives it deems unnecessary. We see nations’ vision of “Zion,” of fullness, of “civilization” not in the flourishing of its people, but in its capacity to dominate the land and the people beneath its feet. To level hills and lay down crushed rock upon fertile ground. And perhaps most tragic of all, we have seen this violence resound in silent songs of normalcy and resentment at the “interruptions” of our lament, our anger, our crying sorrow pouring into the streets — causes for those who wish to eat and be merry. But we have also seen, from beneath the concrete edifices of a deceptive social progress, bodies of righteousness began to spring up into the light of day, sometimes through gaps in the slab or through cracks of their own making. Upon streets, in malls, and in the symbols of our civilization and “progress,” people lay down. They stood where cars should carry people from one place to another. They crowded the entrance of commerce on its busiest days and flooded highways with umbrellas on days where there was no rain. In these moments, people’s bodies and cries filled streets. Their nonviolent protests made righteousness visible. They risked their lives with each step and derision with each shout. They are called “radical” and “thugs” and “rioters,” but are they not, in fact, the face of a God who deplores the dehumanization of God’s people? Is this not the enfleshment of God’s anger when the dispossessed are silenced with batons or hidden by the media’s boredom? In Isaiah 61:10 and 62:1, I am struck by imagery of soil and growth juxtaposed with the refusal to not speak — “For Zion’s sake, I will not keep silent.” Written in the midst of exile and restoration, this text points to the prophet’s sense that there is a reality moving beneath our feet, that the certainty of our days is illusory. But what is certain is God’s working in our midst. Like a plant drawn to sun, with a seed that will spring tendrils of life and press its way through ground — so too are our lives drawn to light, to righteousness, to dignity, to fullness. The land is not simply a natural entity or the mobilized power of military and economic security. More profoundly, land is an icon of love’s orientation, of identity. When planted in a space of cultivation, we will grow, we will nourish, we will be bountiful. Isaiah’s prophetic words to an Israel that exists between exile and restoration are words that call it to remember the ground beneath its feet. As protests interrupted Black Friday, as “die-ins” sprout up in the streets of American cities, as umbrellas unfold in the streets of Hong Kong, amassing like wildflowers in concrete fields, we are witnessing the sprouting of seeds that cannot remain silent — that cannot lie dormant and dark, but press through the cracks of our normalcy. 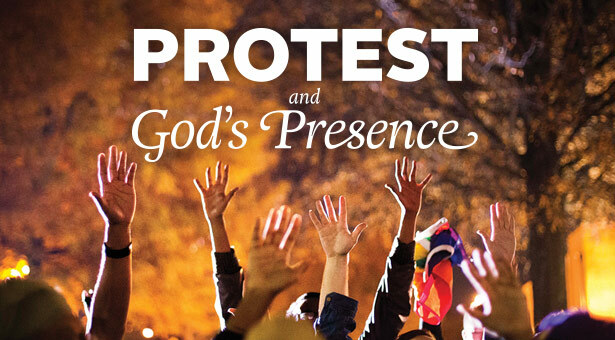 In these protests we see the swelling of God’s love for those whose voices have, for too long, been silenced. But as the crowds ebb and flow, the church is called to be a holy interruption, a seedbed of many voices, scattering them in the city, in schools, in neighborhoods to grow, and to press against the structures of an oppressive normalcy. Will the church say, “For Zion’s sake, I will not keep silent”? Brian Bantum is associate professor of theology at Seattle Pacific University. A version of this article first appeared online in December 2014 as a reflection on the lectionary text, Isaiah 61:10–62:3. Adapted and reprinted with permission by ON Scripture – The Bible. Copyright 2015 Odyssey Networks. All rights reserved.